Gaia joined the SLEWTHS family on March 8th, 2016. 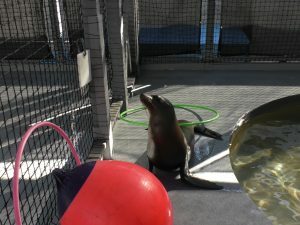 She came to our facility from the Pacific Marine Mammal facility in Long Beach, CA. She was born in 2014 and was a repeat strander, which caused her to be deemed non-releasable. 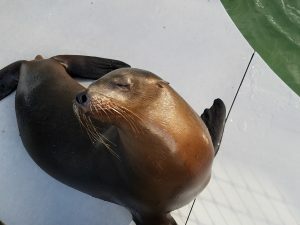 Gaia was found with a fishing lure in her back and had sustained several injuries when she was found, resulting in complete blindness in her left eye. She is an sweet animal who loves food and attention. Since her start here at SLEWTHS, she has learned a variety of behaviors including multiple forms of targeting, weighing, voluntarily caging, and full medical check behaviors with both trainers and vets. She loves playing with toys, eating ice and playing with her friend Freya.